Highly malignant or high-grade gliomas (HGG) are tumours of the central nervous system (CNS). This text provides information about the characteristics and subtypes of the disease, its frequency, causes, symptoms, diagnosis, treatment, and prognosis. Highly malignant or high-grade gliomas (HGG) are tumours of the central nervous system (CNS). They are solid tumours arising from transformed cells of the brain and/or the spinal cord. Since they directly originate from the CNS, they are also called primary CNS tumours, thereby differentiating them from malignant tumours of other organs that have spread (metastasised) to the CNS. HGG in children and adolescents are rare. However, they show considerably malignant behaviour since they usually grow fast and frequently destroy healthy brain tissue. By being able to migrate within the CNS for various centimetres, HGG can induce the development of new tumours. Without the appropriate therapy, HGG can be lethal within only a few months. Due to the usually rapid and infiltrating growth of these tumours, treatment is difficult. 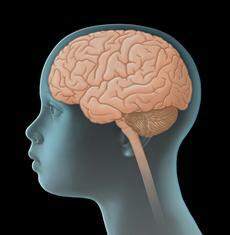 High-grade gliomas account for approximately 15 to 20 % of CNS tumours in children and adolescents. They appear in all age groups; yet, children aged younger than three years are rarely affected. Each year, about 60 to 80 children and adolescents younger than 15 years of age are newly diagnosed with a high-grade glioma in . This corresponds to an incidence rate of 5 to 10 new diagnoses per 1.000.000 children per year. Boys and girls are almost equally affected. Various types of high-grade gliomas (HGG) have been identified based on their localization within the central nervous system (CNS), the cell of origin and the degree of malignancy. High-grade gliomas of the brainstem, such as diffuse intrinsic pontine gliomas, account for about 40 % of all HGG in children and teenagers. Due to their localization within the pons, an area of the brainstem, through which all important nerve tracts between extremities and brain are passing, they can cause various severe neurological deficits and also result in a rapid and fatal course of the disease, even when they are small in size. 60 % of high-grade gliomas are usually found in other parts of the CNS, such as the cerebral cortex. These HGG are classified on the basis of features that can be seen under the microscope (histological classification). This classification has been defined by the World Health Organisation (WHO) and includes high-grade gliomas of WHO-grades III and IV. In children and adolescents, the most common among these are anaplastic astrocytomas (WHO-grade III) and glioblastoma multiforme (WHO-grade IV). Good to know: The various types of HGG differ in frequency and show different growth characteristics, different courses of the disease, different responses to treatment, and thus different outcomes (prognoses). High-grade gliomas originate from a malignant transformation of glial cells (glia). These are cells that, among other functions, provide support and protection for the brain’s nerve cells (neurons). Why glia cells become malignant in some individuals is not completely known yet. It is known so far that children with certain inherited diseases (such as Neurofibromatosis Type 1, Li-Fraumeni syndrome, von Hippel-Lindau Syndrome, Turcot Syndrome, or Bloom syndrome) have a higher risk of developing HGG than their healthy peers. In addition, it has been shown that malignant glial cell transformation can be associated with genetic alterations and chromosomal aberrations in these cells. Such alterations may not be inherited but develop early in childhood. Also, irradiation of the skulp (cranial irradiation), for example during treatment of leukaemia or retinoblastoma, a malignant tumour of the eye, increases the risk of developing a CNS tumour. Most certainly, HGG is caused by a specific combination of many genetic and also environmental factors. Due to the tumours’ rapid growth, symptoms of children and adolescents with high-grade glioma usually develop within a few weeks or months. Symptoms primarily result from the pressure that the tumour first exerts on the adjacent brain tissue and later on, in an advanced stage, on the entire brain (or spinal cord). Also, the local swelling (edema) of adjacent normal brain (or spinal cord) tissue caused by the tumour plays a major role during the development of clinical symptoms. Additionally, depending on the tumour’s localization and the patient’s age, the following symptoms can occur: rapidly increasing head-circumference (macrocephalus), developmental delay, headaches, backaches, nausea and vomiting in the morning, dizziness, gait disturbances, impaired vision, lack of concentration, drowsiness, sleep disturbances, dysregulated appetite, paralyses, and/or seizures. Very close collaboration between various specialists (such as paediatric oncologists, paediatric neurosurgeons, paediatric radiologists, to name a few) is required, both to find out, whether the patient really suffers from a malignant CNS tumour and, if so, to determine the tumour type and the extension of the disease,. Knowing these details is absolutely essential for optimal treatment planning and prognosis. The initial diagnostic procedures for a young patient presenting with a suspected CNS tumour at a childhood cancer centre include another assessment of the patient’s history, a thorough physical/neurological exam and imaging diagnostic, such as magnetic resonance imaging (MRI). The MRI is needed to determine the tumour’s localization, size, and demarcation from sourrounding brain (or spinal cord) tissue. In children with a suspected tumour of the visual tract, an assessment by an experienced eye specialist (ophthalmologist) is also performed. For most patients, final diagnosis is backed up by microscopic (histological) examination of tumour tissue that has been neurosurgically removed (biopsy). Children with pontine glioma usually do not undergo neurosurgery, since the risk to cause further damage to this highly vulnerable CNS region is high. Besides, high-grade gliomas of the pons can usually be identified by experienced paediatric neuroradiologists based on characteristic MRI-features of these tumours. Following neurosurgery and after the diagnosis of high-grade glioma has been verified, further (adjuvant) treatment is planned. In order to provide optimal therapy, certain individual factors influencing the prognosis of patients with HGG (risk factors or prognostic factors) are being considered during treatment planning (risk-adapted treatment strategy). Important prognostic factors are the type, the localization, size and spread of the tumour, and the extent of neurosurgical tumour removal. Also, the patient’s age and overall physical condition play a prognostic role. All these factors are included in the treatment plan with the aim of achieving possible best outcome for every patient. If high-grade glioma has been diagnosed, treatment should be started as soon as possible in a children's hospital with a paediatric oncology program. Only in such a treatment centre, highly experienced and qualified staff (doctors, nurses and many more) is guaranteed, since they are specialized and focus on the diagnostics and treatment of children and teenagers with cancer according to the most advanced treatment concepts. The doctors in these centres collaborate closely with each other. Together, they treat their patients according to treatment plans (protocols) that are continuously optimised. The goal of the treatment is to achieve high cure and low rates of side effects . The most effective treatment for children and adolescents with high-grade glioma is a combination of neurosurgery, radiotherapy, and chemotherapy . Among these treatment modalities, neurosurgery is of highest impact, since the extent of tumour removal significantly determines the further course of the disease. The more radical the tumour can be resected, the higher are the chances of survival. According to the current standard of knowledge, surgery and radiation have proven to extend the life-span of a young patient with high-grade glioma. Yet, surgery or radiation cannot be performed in every child. Many tumours of the brain stem, such as diffuse intrinsic pontine gliomas, are neurosurgically not accessible. Also, radiotherapy of the brain or spinal cord is not recommended for children aged younger than three years. Previous therapy optimising clincial trials have shown that additional (adjuvant) chemotherapy can improve treatment results. However, no treatment approach ensuring that the tumour will not start growing again after a short while has been developed so far. Treatment according to protocol HIT-HGG 2007 (see below) involves neurosurgical tumour resection followed by combined radio- and chemotherapy. Chemotherapy consists of five to six weeks of daily treatment with the anticancer agent Temozolomid. Major goal of the intensive treatment is to either shrink residual tumour tissue after incomplete resection or to fight those cancer cells that may have remained in the body even after radical surgery. The intensive treatment phase is usually followed by a less intense though longer-lasting therapy (maintenance therapy) which aims at further improving the patient’s outcome. This therapy phase consists of treatments with Temozolomid given on five consecutive days once a month. Total treatment duration is one year. In Germany, diagnostics and treatment of almost all children and adolescents with first diagnosis of high-grade glioma (HGG) are performed according to the treatment plans (protocols) of “therapy optimising trials”, so named because the treatment concepts of such trials are continuously being optimised based on the latest medical knowledge and the experience with former protocols. Therapy optimising trials are standardised and controlled studies that aim at steadily developing and improving treatment possibilities for cancer patients. Trial HIT-HGG 2007: Multicentric therapy optimising trial for the treatment of children and adolescents (age: 3 to 17 years) with first diagnosis of high-grade glioma or pons glioma; numerous childhood cancer centres throughout Germany, Switzerland, and Austria participate in this trial. The German trial centre is located at the Department of Paediatric Oncology/Haematology, University Hospital Göttingen (principal investigator: Prof. Dr. med. Christof Kramm). Currently, a new trial is being prepared (HIT-HGG-2013), which will probably start in July 2016. 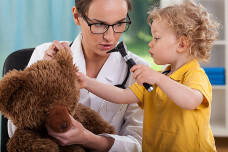 Therapy recommendations for children younger than three years: Currently, a clincial trial is being planned for the treatment of infants and toddlers (aged younger than three years) with first diagnosis of HGG throughout Europe. Until the opening of this trial, children under three years are being treated according to the recommendations which will form part of the future trial (therapy excluding radiotherapy). Despite improved methods in diagnosis and therapy, prognosis for children and adolescents with high-grade glioma is still unfavourable. The overall probability to survive 5 years after the initial diagnosis was made is currently about 10 to 19 %. It is significantly dependent on the localization and type of high-grade glioma as well as on the extent of tumour removal by surgery. Therefore, the overall survival rates vary between 50 % for patients after complete resection and 0 % for those children for whom no anticancer therapy is possible at all. In general, the possibility to develop recurrent disease (relapse) after successful first-line treatment is high for young patients with high-grade glioma and prognosis for patients with relapsed HGG is even worse. A new treatment approach has to be considered carefully to maintain appropriate quality of life for the patient. Current therapy optimising clinical studies aim at further improving the treatment options and reducing the side-effects for patients with childhood (relapsed) HGG. Further specific knowledge of the disease is intensified by associated research projects, the results of which will determine future treatment protocols. Note: The survival rates mentioned in the text above are statistical values. Therefore, they only provide information on the total cohort of patients with childhood HGG. They do not predict individual outcomes. HGG can show unpredictable courses, in both patients with favourable and patients with unfavourable preconditions.